Whenever there are edits to files, or new files synced, or files and folders shared with you, or tasks assigned to you, comments on files or @mentions about you on Dropbox file hosting service, Dropbox desktop client sends notification pop-ups to notify you about the events. 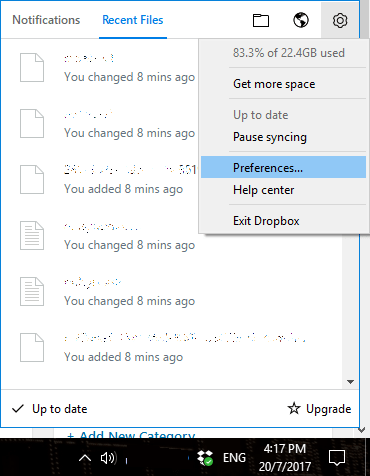 If you use Dropbox as a cloud location from synchronization of files or apps data across multiple devices, or use Dropbox as the automatic backup destination, you may receive frequent notification messages about files changed or files added to Dropbox. The regular notifications can be annoying. Open the Dropbox desktop app by searching, or clicking / tapping on Dropbox icon on notification area (system tray) and select Gear (Settings). Click or tap on OK or Apply when done. You will no longer receive notifications when the events that you unselected happened.